Do you remember that exhilarating feeling when you meet someone and instantly feel connected? Your thoughts seem to be similar, you react to things the same way, you even seem to complete each other’s sentences and you decide, at last, I’ve found someone who totally gets me. Then, you get to know more of each other and a sense of foreboding starts creeping up, the sixth sense that seldom goes wrong tries to warn you that what you see may not be what you get. And ultimately, a sense of resignation, a foreboding feeling of being fooled does you in. That’s exactly what happened to me with this book. 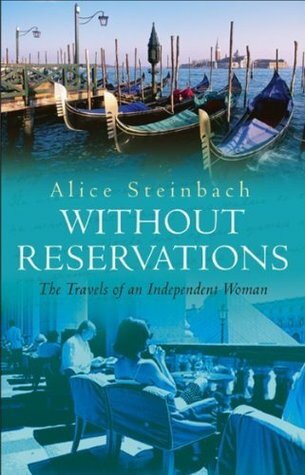 Alice Steinbach, a Pulitzer prize winning journalist had always dreamed about chucking it all and seeking out an unencumbered life free of plans and schedules, at least temporarily. And she does just that, her sons having moved out and she herself having reached a phase in life where she could afford to do it. The book is a chronicle of her journey through Paris, London, Oxford and Italy over a period of six to seven months. The connect was instant. The yearnings and the apprehensions were very familiar. On one side were the years of longing to go out on one’s own, be just who you are sans any limiting definitions of being a daughter, wife, sister, mother, professional and all hundreds of labels by which one is defined. On the other side, the thoughts of whether one could actually do it, that nagging feeling of what would the family and friends say, however sure you are they would encourage you. These were the exact thoughts that seemed to have gone through the author’s mind as well. The beginning was quite exciting. The flutter in your heart as you anticipate the unknown, interspersed with the excitement of finally doing something that you have always wanted to. Adding to the lure was the thought that here is a woman who seemed to have transcended the need for a man in her life, one who could stand on her own and enjoy life on her own terms. The fascination started waning even before Paris was done. It was probably a mismatch in expectations. Here I was on one side, with an audacity to think that a prize winning Baltimore Sun columnist’s journey would be similar to a nobody’s week long solo trip to an unknown place. The fault is entirely mine. Instead of on a shoe string budget sojourn across Europe that was expected, what I got was exquisitely beautiful people, exotic shopping and dining in gourmet restaurants. And of course, an adoring and understanding, rich Japanese man who falls in love with you at first sight. Yes, the fault is entirely mine, what right did I have to expect anything different? What I found quite unsettling is the fact that in spite of portraying herself as the quintessential woman of today, she still seemed to feel incomplete without a man in her life. Even while writing about the places she traveled to and the people she met on the way, it was as if her mind was revolving around her Japanese love. Everything else felt incidental. An easy read, for a lazy afternoon. You will love it , if you love Danielle Steele novels.